A sturdy tripod... I usually spend a fair amount of money on this basic tool to get one that will not wobble in the wind, and has adjustable legs. 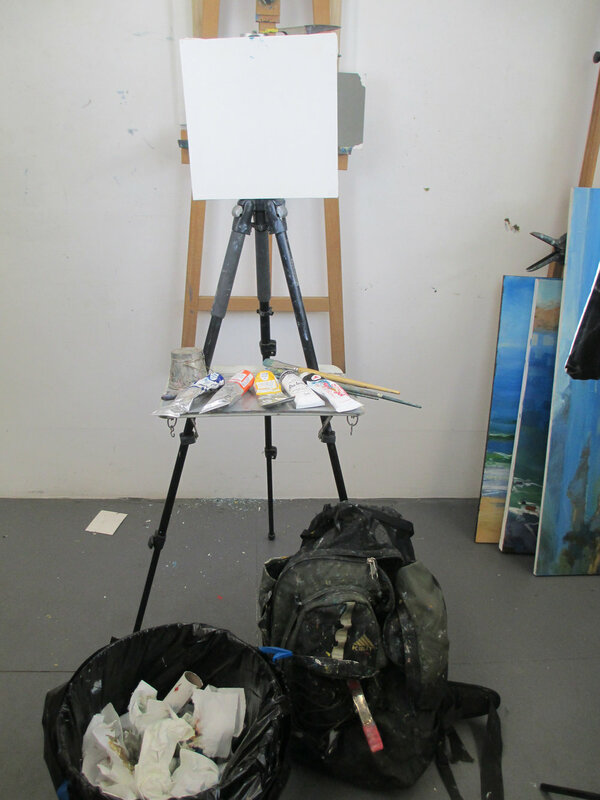 I have clamped the canvas to the tripod with a clothespin-shaped wood clamp. The shelf below is custom made for painters, and is available from painting catalogs, or you could make one or jerry rig one with more wood clamps.This kit can paint large even with limited paraphernalia. With a weight on the tripod, I can paint 20 by 30 outdoors. I usually take three or four of these wood clamps outdoors with me, and a garbage can, and a big backpack for carrying everything. I have a policy to get off the road to paint, and to hike away from the car, hence the pack instead of a cart with would have trouble with my climbing and clambering habits.